Let me pre-curse this post with a very important life tip: never take a pregnancy test on a Friday night with a house full of family when you aren’t trying to get pregnant. Just trust me. When I found out I was pregnant, not only did I go through a stage of denial and then panic, I quickly realized that if this test wasn’t lying to me, I would be having a baby during baseball season. While this statement may not mean much to you, I was immediately horrified as I imagined a lonely pregnancy in Cincinnati without family, friends or a husband half of the time, growing a human during the most stressful months of the year, Mat possibly missing the birth of our first child. The list goes on. I cried for WEEKS. While we didn’t plan on having a baby just yet, we planned on one day planning it so that our first child would be born in the off-season for all sorts of (hopefully) obvious reasons. I somehow managed to forget that we live life on the no-plan plan and here it was- another curve ball that I wasn’t ready for (excuse the corny baseball pun, I had to do it). Back to choosing the timing of a pregnancy test wisely, four weeks went by and it was finally time to go to the doctor to confirm that this stick wasn’t a liar. I was living in a little bit of shock with a side of disbelief in the meantime. As you probably know by now, a little Latos was in fact on the way and we were told when our little alien would make it’s way into the world. The first thing I did was open my MLB At Bat app to confirm the last thing that I ever wanted to see- my due date falling right in the middle of a road trip. MOTHER OF GOD. Earlier last year, a handful of athlete’s and their wives caught a whole lot of criticism for having babies during their husband’s respective sports season causing said athletes to miss games for paternity leave. Some sports talk personalities even went so far as to say that the athlete’s should not have missed games for the births of their children referencing reasons like it being the second child, playoffs, etc. I watched all of this unfold in horror as I sat there making my own little human who could possibly one day inconvenience the sports world. GREAT. While it shouldn’t have affected me, hearing all of that negative banter about an already insane situation (in my mind) just added to my anxiety. To each their own but child-birth was easily on my top 3 list of fears and I couldn’t imagine going through it without my best friend by my side. While a due date is nothing more than a possible day that your baby MIGHT come, you still have to operate as if that’s the day you need to be ready and I had three choices. The first was a natural . The pro here is that this is generally the most healthy, best option for both mother and baby. The con was that there would be a good chance that Mat would not be able to make it back on time once I went into labor as he was scheduled to be on the road a few days before and after my actual due date. That was a huge (emphasis on HUGE) con for me right off the bat so I wrote this option off almost immediately. The two choices left were to plan to induce labor or plan a c-section. I won’t go through the laundry list of reasons why a c-section was more appealing to me given our situation but I will tell you this- this was one of the hardest decisions of my life. Fortunately my due date was close enough to an off-day to schedule baby extraction surgery on that day. This decision allowed for Mat to be in the hospital with us all day and return to work the following day. 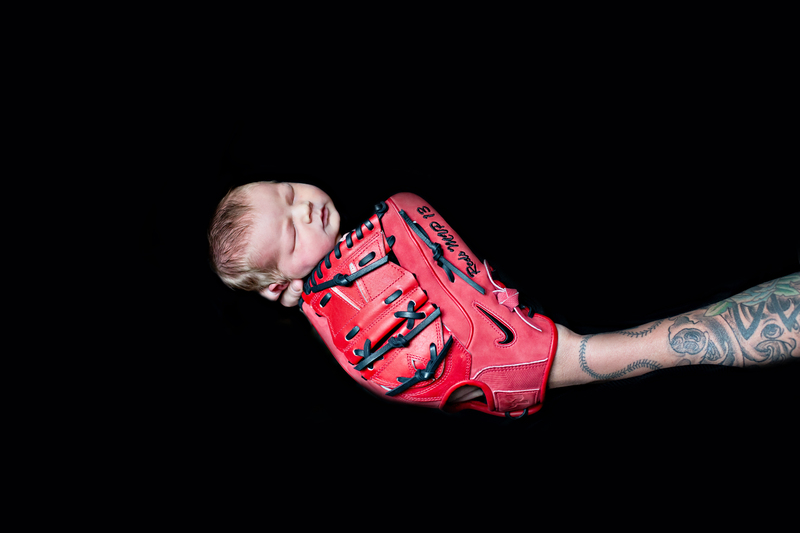 Landon was born on a Monday and Mat was scheduled to pitch that Thursday. As daunting as my in-season child-birth once seemed, it actually worked out perfectly as Mat didn’t have to miss a start to be there. MLB allows players 3 days for paternity leave so Mat slept at the hospital with us and went to work from there until we were released. He took his paternity leave once we were allowed to come home and then he met up with the team in Baltimore. There was no point in him sitting in the hospital with us for three days so we decided that it would be best that he take his time off once we were allowed to come home to make the adjustment to life with a newborn a little easier. Plus, with a ten-day road trip right around the corner, I was worried that he wouldn’t have enough bonding time. I was worried that I would feel like a nightmare post surgery. I was worried that he would be stressed out. It’s accurate to say that there is not much I wasn’t worried about at that point. Speaking of points, I’m not sure where I’m going with this post other than to do what I always do- humanize the game. I am in no way trying to paint a picture of a sob story or even complain about our situation because we are #BLESSED, but people can be so quick to be cruel about a number of things that they may not fully understand. It would be unfair of me not to acknowledge that things could have been much more complicated. Imagine if Mat was in the minors and it was a financial burden to travel. Imagine if the baby came early and he couldn’t get back on time despite my meticulous planning. Imagine the military dads who are overseas when their children are born. While there are always scenarios where “things could be worse” (or more complicated), this is our story. Countless people criticized my decision for a planned c-section but I knew that this was the only reasonable scenario given the circumstances and nobody had to experience it but me. I cannot express enough that it is so, SO kind to think before you offer unsolicited opinions on personal matters. It’s easy to judge but it’s never too soon or too late for a reminder that we don’t always know what goes on “behind closed doors”. In a word, this year has been weird. Couple of long trips to the DL for Mat with a long trip to the PL (pregnancy list) for me and things just got funky. Funky and weird are not synonymous with terrible by any means, it’s just the simple fact that Mat wasn’t playing in games and I was relatively secretly growing a human. Lots of tip toeing around social media took place. A few panic attacks came with the slip-ups of TV guys. Finally, we went to the Hall of Fame gala and I was just over it. I posted a picture on my Instagram account of Mat and I, Mat’s hand ever so gently on my belly and I managed to only make one joke about having eaten too many burritos. Success. Little did anyone realize I was 37 and a half weeks along and, up until that point, I had spent a crafty amount of time in baggy clothes and avoiding most social situations. I’m not even kidding when I tell you that I found a black shirt at Urban Outfitters in San Diego that hid the alien bump like a champ and ordered 10 online when I got home. TEN. I proceeded to wear these shirts basically every day past the seven-month point, when I actually started to look pregnant rather than just plump or chubby or like I had missed 399 work outs. It wasn’t that these glorious black shirts made me look good, because they didn’t. In fact, they’re terrible in their own right. But perfectly baggy. Unassuming. Safe. My own personal pregnancy invisibility cloaks. The only thing I really had to hide over the past 40 weeks was my sanity and there was simply no other way to protect it. With pregnancy comes the most obscene amount of personal questions and fact pedaling and while I love staying connected via social media, I had no idea how pregnancy hormones and ridiculous commentary from all corners of the Internet would go together. I am confident that I made a great choice. Let me just tell you that you guys missed out on a lot of funny material as my friends had to put up with my nonsense all on their own because instead of putting my random thoughts into tweets, I actually sent them to my “real-life friends” like it was 2007 or something (don’t worry guys… I’m back to tweeting). Now that it’s been a week, I’m not sure how I will handle social media as a mom. I swore I would never be “one of those moms who posts pictures of my babies planet baby gear, matching perfectly with me, all of the time” and as it turns out, I lied. I wasn’t even planning on saying anything about having a baby until the Reds had to announce the roster move for paternity leave and yet I found myself posting a picture from the hospital because I was so excited and filled with love that I would have screamed it from a mountain top had I not been on bed rest (that might be a stretch because that actually sounds really taxing but you know what I mean). p.s. Should we alert ESPN that he looks pretty cute naked and in a glove for next years “The Body” issue or no? As my close friends who are all currently pretty far away know, I’ve been doing a good amount of whining this spring training. I’m not proud but I’m not perfect and I’m sure in the hell not content 24/7 so it is what it is. Every time I complain, I feel some kind of guilty. Maybe I consider how fortunate I am. Maybe I realize that things could be worse. Maybe I think of all of the people who would be quick to call me names if I expressed my current feelings on social media. Maybe… Just maybe I know that I have nothing serious to complain about but that still doesn’t change the fact that I just don’t feel like a ray of sunshine all of the time. There are many baseball ladies who do not accompany their significant others to spring training. Some have children who are in school, some have other responsibilities at home, and for some, it’s not even a possibility due to financial restrictions or job schedules. You will find many MLB and MiLB ladies out there as we speak who are bummed because their favorite dude left for spring and they won’t see him for a few weeks or even months. That’s not me. Like every other season, I packed my junk and made the temporary move to Arizona because that’s just how we do it. In the past, spring training was always a temporary move leading to another temporary move. There were seasons where we didn’t even know where we would end up at the end of it and others where we drove over from San Diego and then back to an apartment with a ton of unpacked boxes for decorations because I knew we wouldn’t be there long anyway and it was just inefficient to unpack things we didn’t really need just to pack them up again. Last season, we flew back to Cincinnati and stayed at the Westin, living out of suitcases for a while. Looking back, I guess my jokes about being a gypsy were never a joke at all. The difference this spring training is that we actually have a home to miss (an even bigger reason to feel ridiculous for not putting my super happy Stepford wife face on every day). Granted, I have no actual desire to be home without my guy yet I can’t help but miss waking up to foot warmers in the form of cats sleeping on my feet and 3 huge dogs slobbering all over the place. I just want to drink coffee in my own kitchen while I plan out my errands for the day. I miss my gym. My routine. My friends. My sister. I might even miss the lady down the street who always thinks we’re speeding because our cars are loud. The thermostat in our bedroom that always makes it either too hot or too cold- I kinda miss that too. I refuse to believe that these feelings make me ungrateful or unaware of my blessings. I’m thankful to wake up every day in sunny Arizona to my husband’s 6 am alarm (okay, I hate the alarm). It’s nice that he gets home from work at a decent hour and aside from a knee injury, there’s been nothing serious to stress about. I’m no authority to tell you what to do but I’m pretty certain that feelings are feelings and they are valid no matter how silly or irrational they might seem to others or even yourself when you really step back and think about it. As much as I keep expressing that I want to be home, I know that being in Cincinnati right now would have its own set of challenges. After all, the first step is admitting you have a problem, right? Right. It’s only then that you can choose to fix the things that don’t bring you happiness or you can learn to be at peace with them. I would like to start this post off by saying that I absolutely love the name of this event. If we ever expect to help people overcome hardships, not only do we have to provide a helping hand but we absolutely have to establish a system that will assist them in reclaiming independence and building a new life. This off-season we were fortunate enough to be able to do a little volunteer work at the Emergency Shelter of Northern Kentucky. I was more than impressed with the dedication of the staff, the way the shelter is run as well as what it offers residents. While we sadly wont be able to attend this event as we will still be in Arizona for spring training, I am asking you guys to check it out, spread the word, attend if it strikes a chord in your heart or even make a donation if you would like to. 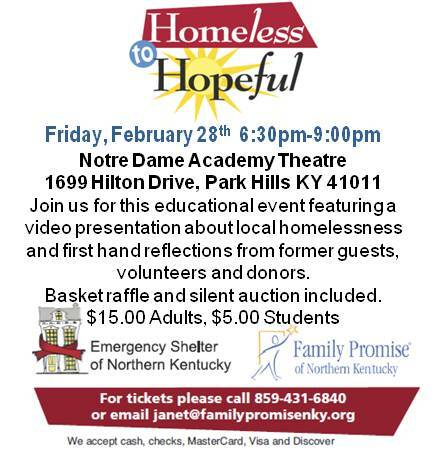 Homeless to Hopeful is an event to raise awareness about homelessness and it is taking place on Friday, February 28th from 6:30 to 9 p.m. at the Notre Dame Academy Theater. This winter has proven to be a challenge for all of us, but especially for those who are homeless. The Emergency Shelter of NKY has sheltered already this winter close to 400 adults and Family Promise of NKY that sheltered family was full every night. Local statistics within the Emergency Shelter of Northern Kentucky, indicate an overall 18% increase in homelessness. ESNKY is also searching for a new home to ensure that we continue have the one and only cold weather shelter in our region. The 2nd annual Homeless to Hopeful event will raise awareness of homelessness in our own NKY community. Videos with real testimony as well as live speakers will be a part of the event. Jessica Noll, from WPCO will act as emcee. The event will also feature basket raffles and a silent auction to raise funds for both Family Promise and the Emergency Shelter of NKY. Mat Latos has provided a signed jersey and baseball. Wine baskets, round trip airline tickets and other themed baskets will be available. Giving back and helping others is something I grew up doing. There are so many charitable causes out there and so many people and groups who can use a helping hand. Many times, all you have to have is a big heart to help them. I vividly remember 8th grade where I had to log 100 hours of community service over the course of the school year to graduate. I could volunteer anywhere I wanted as long as it was approved by the school. I chose to volunteer at a convalescent hospital. I don’t recall why I chose that project but I do recall feeling awful for the elderly people who had sort of been abandoned by their families or simply didn’t have any family. You don’t know what “lonely” is until you find yourself living in a medical institution where you have permitted social hours and are otherwise constrained to a room with a hospital bed. I will admit that I was uncomfortable at first. A lot of the residents had mental illnesses. Some of them wouldn’t remember my name from week to week. Some thought I was their daughter. Some came out of their bathrooms without their pants on. I was a teenage girl and quite frankly, I wasn’t sure how to process all of that. What I did know was that no matter what oddities I experienced, I would always leave knowing that I made someone’s day who no one else really took the time to care about. Need I go on to tell you that that’s an awesome feeling? Probably not. In high school, my mother decided that we should volunteer to prepare dinner for a homeless shelter whenever we could. Sometimes it was her, my sister and I. Sometimes friends helped. It was a small shelter that only took about 60 people a night. My mom and I would cook our butts off (with the help of my baby sister) and deliver a warm meal to a shelter of men, women and children to what was really just a building with cots to sleep on and tables to set the food on. I will admit that I was uncomfortable at first. I felt guilty. Who was I to waltz in there with enough food to feed 60 people to people who had nothing? Were people going to treat us strangely? Were we going to make them feel bad? The first time we served the homeless a dinner of spaghetti and meatballs was one that I will never forget. I was so nervous that I barely spoke at first. I just didn’t know how to interact because I felt so fortunate to have a roof over my head. I wasn’t living a lavish life but I had a single mother who busted her a-word and was fortunate and good enough at it to take care of my sister and I. That’s more than so many people could ever wish to ask for. The night progressed. I served some plates. Shared some smiles. Felt terrible that these beautiful souls found themselves suffering in the place they were. Without a home. Without a family able to bust their a-words to help them. Some of these people didn’t even have family. Some of them had been laid off from their job and living paycheck to paycheck was no longer an option. One of them went to my high school and played on the varsity basketball team. I saw his face come through the line and I didn’t know whether he wanted me to recognize him or not. I didn’t know what to say. I didn’t know what to do. I sort of froze. I racked my brain. Do I act normal. Do I keep my head down. I wasn’t friends with the guy but he recognized my face and I his. I rashly decided that I was going to treat this as a normal interaction to ease the tension. I acted like I knew him. Made small talk. Made him feel large talk. It was the right decision. He looked nervous- like I might tell people at school. I never did. I don’t even think anyone knew I was volunteering there? I didn’t exactly have many friends in high school but that’s another subject. He will probably never know it but his energy and resilience inspired me in more ways than I can describe. Once everyone was served I decided to talk to some other people. Socialize. Treat them like normal humans. So many people forget to do that. I learned that some had lost their jobs. Some lost everything in a bad divorce. Some couldn’t find work for months. Some had been disowned and were struggling to find their way. Some didn’t have a single family member or friend in the world. Some didn’t want to talk they just wanted to eat and sleep. The ridiculously outstanding revelation was this- they were all people just like you and me. They were all so appreciative that we bothered to bring them a meal. And care. Because no one else cared enough to help them. I will never forget my experience there. I will never forget the lessons I learned. I will never forget that there are millions of homeless people struggling in our nation. The thing is- it’s so easy to give time, money, and any charitable energy to a cause that hits close to home. Disease hits close to home, cancer hits close to home, animals hit close to home. All more than worthy causes. Most of us have relative or animal friends who have suffered a cruel injustice but most of us will never experience what it’s like to not know if you have a safe place to sleep at night. Many of us will never even consider that anyone could become homeless at any given moment. It’s an issue that lacks awareness and I really hope to assist with changing that. Long story long, I am thrilled to finally have a few things in line to help the homeless in our community and I might ask that you will join me every now and then. The only resource you need to help others is a big heart, an open mind and a little spare time. p.s. Google your local homeless shelter. A $10 investment of a loaf of bread, some peanut butter and jelly may go a long way. A $0 investment of donating a coat or blanket you don’t need will likely make someone’s day as well. You might have seen me mention food allergies or whine about the fact that I can’t drink wine without getting sick over the past few months. You have probably seen me posting gluten-free meal ideas. You may have caught the one tweet where I complained about having to take a million supplements every time I eat. I never planned on sharing the why with you all but in order to make a point, I am going to have to. A few months ago, I began to see a naturopathic medical doctor for various reasons. I was mainly sick of feeling absolutely terrible and being prescribed anxiety medications because “nothing was wrong” with my blood work. I was sick of taking anxiety medication just to function. I was sick of not being myself. After a few hours of testing, we discovered a ridiculous amount of things that were going wrong in my body. Goody. Of the list of health short comings, the worst was my digestive system. To put it simply, anxiety can be caused by a lack of harmony in your gut. Even more ridiculous- being stressed out can cause the exact digestive issues that in turn cause you to have anxiety. Pretty rude, right? Right. (Especially when you deal with the amount of stress I have been subjected to). Over the past few months, I have been busting my a-word trying to get my digestive system working properly with hopes of feeling like a human again. Through supplements and mindful eating, I have managed to get a grip on things. I’m still not in perfect health but this didn’t happen over-night and it’s not going to go away over-night so I continue to work on it. I’m happy to report that I only have to take anxiety meds on rare occasions. And that’s awesome. Let me get to the point- It feels so good to feel like myself again but it has also opened my eyes to just how terrible I had been feeling- mentally and physically. Last year was one of the most miserable years of my life and I have been through some pretty dark times. It wasn’t just the year itself, it was that I was already so beaten down (although I would have never admitted it) that everything hit me like a ton of bricks. All I kept thinking is WHEN AM I GOING TO CATCH A BREAK. Newsflash: If you want to catch a break, you better give yourself one. If you’re like most, you have no idea what I just said. On paper, my life looks so nice and easy that people are quick to be offended if I have a bad day. On paper, my life looks so easy that I am quick to be offended by myself when I have a bad day. But the thing is this- I am only human and the paper lies. Life isn’t about comparing your struggles to those of anyone else but it is about being compassionate enough to know that we all struggle at one point or another. To give you some perspective, there were days that I stayed in bed until 5 pm. The day would start out with me pretending to be fine, Mat would go to work around 1 pm, I would get back in bed and lay there- lifeless, sometimes crying (embarrassing but I’m not much of a liar so there you have it), missing my friends, missing my family, ridiculously lonely, lost, sad, wondering if I was making terrible life choices. I’d eventually hate myself for feeling that way because what reason on earth do I have to be miserable on paper? I’d peel myself out of bed, put some clothes on and go to the ballpark because if I didn’t, I would have never left our apartment/ socialized with anyone other than Mat (who was dealing with a boat load of his own stress) and the Kroger cashiers. I was so sad and out of sorts that I didn’t even bother to socialize with other wives most of the time because I was so ashamed of myself for feeling rotten and didn’t want to bother anyone else with my negative energy. Note: Due to the nature of the business, wives and girlfriends in baseball try to be supportive of one another. When things like trades happen, most of them have been there, done that. They know that your life just got flipped upside down and that you are entering alien territory. Even the Reds front office reached out to us/me in ways that I will forever be grateful for. Sure, my friends and family were only a phone call away but it takes a lot for me to admit that I am struggling and even more for me to seek help. Being strong is my thing. Other people need me to be strong (I think). They are used to me being strong and independent (I think). Part of that is me being stubborn and more of that is me needing to know that I can stand on my own two feet (I know). Note: if you’ve never experienced a panic attack, be thankful. I am sure they are different for everyone but mine are usually something like a racing heart, lack of ability to see straight, tingling, freezing cold, and 178% certain that I’m about to die. Not exactly ideal driving conditions. Let’s not forget all of the times that I was attacked on the internet. Maybe I said something that offended people. Maybe Mat gave up 6 billion runs and people wanted to send us both back to San Diego in body bags like it was our choice to disappoint them. Luckily, I had a decent amount of experience dealing with blind hatred and vile people on the internet but I don’t care who you are-you can only hear that you are hated, worthless, a terrible person etc. so many times before you wonder what you did to deserve to be treated like that. Note: No one deserves to be treated like that. This brings me to a point that I would scream at the top of my lungs if that meant that people would hear me…. YOU NEVER KNOW WHAT PEOPLE ARE GOING THROUGH. BE KIND. If you are going through a hard time, I truly wish for some light for you because I hate the thought of anyone else struggling. Looking back, I must say that it is never in your favor to be hard on yourself. “Life is a journey, not a destination” and I am a cheese ball and a half for referencing that quote but you have to trust the process and know that brighter days are ahead… you just have to be willing to find them- no GPS included. Tomorrow night, Mat will be a guest on the Reds Hot Stove League Radio Show at Holy Grail from 6-7 pm. He will be doing some talking, autograph signing and all of that good stuff. If you miss baseball, come get your fix from 6-7! We are teaming up with Holy Grail to collect donations to go to the Drop In Center- Cincinnati’s largest homeless shelter. If there is a blanket, coat, winter hat, unopened toiletry items, pantry items or really anything that you can part ways with, we ask that you bring it in with you. We will be collecting the donations and delivering them to the shelter. Last year, we had a costume contest for people dressing as Mat or I on my blog. This year, we want to have a costume contest for your animals. Send us pictures of your animal friends in their best Halloween outfits for a chance to win cool prizes and be featured on my blog. Employees, officers, directors, representatives and agents of any MLB entity and each of their respective parents, subsidiaries & affiliated companies and their immediate families and those living in their same household, whether or not related, are not eligible for any So I Married A Baseball Player… (dallaslatosmlb.wordpress.com) giveaway. So I Married A Baseball Player… (dallaslatosmlb.wordpress.com) will determine giveaway recipients in its sole and absolute discretion. If you have received a So I Married A Baseball Player… (dallaslatosmlb.wordpress.com) giveaway in the last 30 days, you’re not eligible. If you live more than 100 miles from the ballpark where a game for which tickets are being given away will be played, you are not eligible for that ticket giveaway. If a giveaway recipient is determined to be ineligible, So I Married A Baseball Player… (dallaslatosmlb.wordpress.com) may, in its sole and absolute discretion, not give away the goods or ticket(s) or may give the goods or ticket(s) to the next eligible follower. You will be required to privately (through Twitter direct message or email) provide your name and address if you are selected as a giveaway recipient. So I Married A Baseball Player… (dallaslatosmlb.wordpress.com) will not keep or store your information or use it for any purpose other than sending your giveaway item(s) or providing you information on receiving the item(s). Giveaways are subject to all applicable federal, state and local laws, rules or regulations.